The Panzer Brigade formations were created in the summer of 1944 with the idea that smaller, kampfgruppe like, units would be more agile to employ. When compared to the larger and more cumbersome panzer division these units could be deployed more quickly in counter attacks and other situations that required expediency. Not everyone agreed with creating the new units as they required new equipment that was needed to refit the panzer divisions after a costly Normandy campaign. 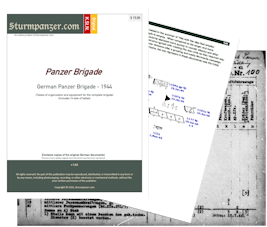 The Panzer Brigades of 1944 came in two versions, the one below represent in these documents was the initial version. These are a set of original K.St.N. documents. The set includes a K.St.N. 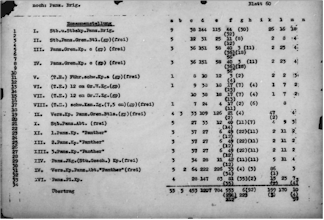 listing with counts for each of the columns in the K.St.N., so in effect you get the man and equipment counts for the entire brigade.